It's time for another monthly favourites! I love writing these as I get to reflect on the month and collect together little bits and bobs that I have been using a lot! 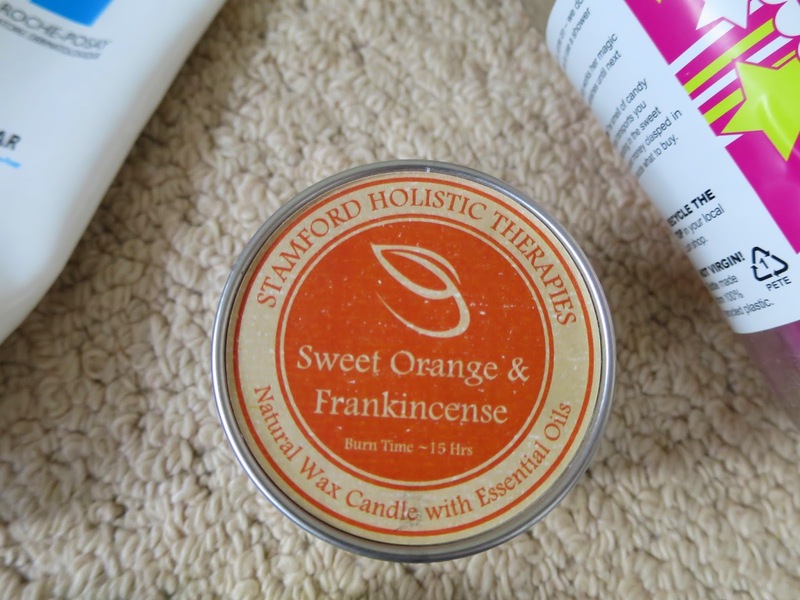 Primark Sweet Vanilla and Coconut candle - I featured this in an old haul post back in January. As I have lots of candles, it was until only recently that I started to burn this. Vanilla is one of my scents and fused with the Coconut it makes the room smell nice and sweet - but not too sweet, if you follow my drift. For only 80p, I would definitely recommend picking it up but if you don't like this flavour combination, there are a few more in the range. Rimmel lipstick in Pink Blush - As the weather is getting nicer and it is finally Spring, this shade is perfect for everyday wear. I have been wearing it under a lipgloss and it looks quite pretty. It also has one of those packagings that makes a satifising click when you open and close it; so I tend to fiddle around with it because I like the noise - a bit strange, I know! Generally though, this lipstick is in a lovely shade for the Spring and it lasts on my lips all day. Fleur d'orange perfume - Ever since I was little, I have bought this perfume from Fragonard when I use to visit Grasse, in France. It has such a fresh yet slightly fruity scent which I adore. In terms of price, it is very reasonable and you can now not only buy it in France but you can actually pick this up in M&S. My family always say that this is my signature perfume and as I have worn it for many years. I'm featuring it in a monthly favourites post as I have made an active effort this month to put it on everyday and have been somewhat neglecting my other fragrances. Rimmel Eyebrow Pencil - I bought this in the month of April and have worn it most days throughout. Before this, my only other brow product was Speed Brow by Benefit so this was my first go at an eyebrow pencil. I have really liked how easy it is to define your brows. Although, I have to mention that I think the shade is too light for my eyebrows so I will most likely have to buy the next shade up. Regardless of this, the product is really good. A hair tie - I have been wearing hair ties a lot recently because they don't leave big creases in my hair and they look cuter than just a regular bobble. This one is from Accessorize and it came in a pack of four. 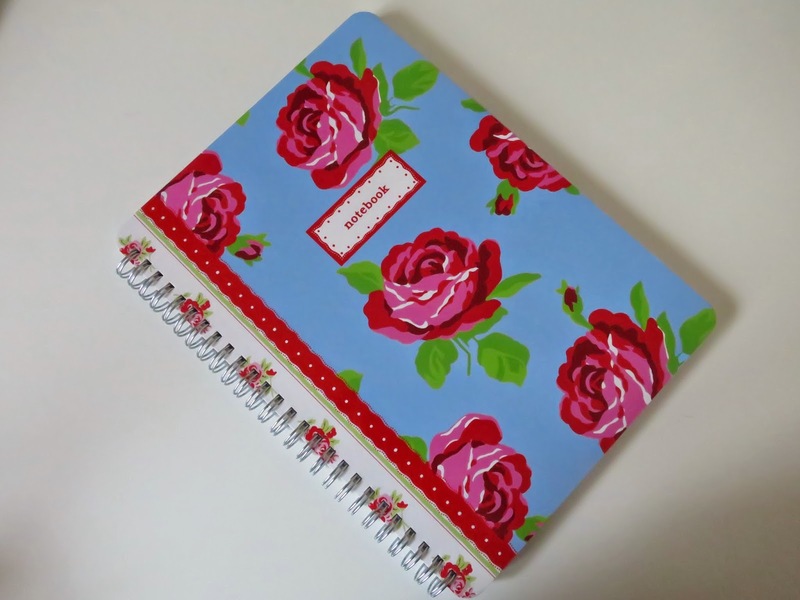 Cath Kidson notebook - My Mum kindly purchased this for me and I absoulety love the floral design of it. I use this to keep organised and write lists - I'm a compulsive list writer! To start, my acrylic drawer is from Muji - if you are looking for a way to store your makeup, I would definitely recommend you check these out as they are really affordable and are of a high quality. I have four drawers in total: one for face products; another for eye products; the third drawer contains palettes plus a few random products that didn't really fit in a category and finally I have my lip drawer. In here, I store lip balms, lip glosses and lipsticks; I don't own any lip liners in case you are wondering! In terms of lip balms, I don't tend to spend too much money purchasing them. Actually, all of the lip balms in my drawer, at the moment, have been given to me as a present which is really kind. The first two are from the brand Extracts which were in a pack of three from Marks and Spencer's - I have used the other one up, it was really nice and smelt like coconuts! To the right, there is another lip balm that is from Marks and Spencer's and next to that my Snow fairy lip tint. This is so good, the colour lasts and it smells exactly like my beloved shower gel, almost good enough to eat! My final lip balm is from Model's Own, this is my least preferred product as it moisturises your lips only momentarily during application. 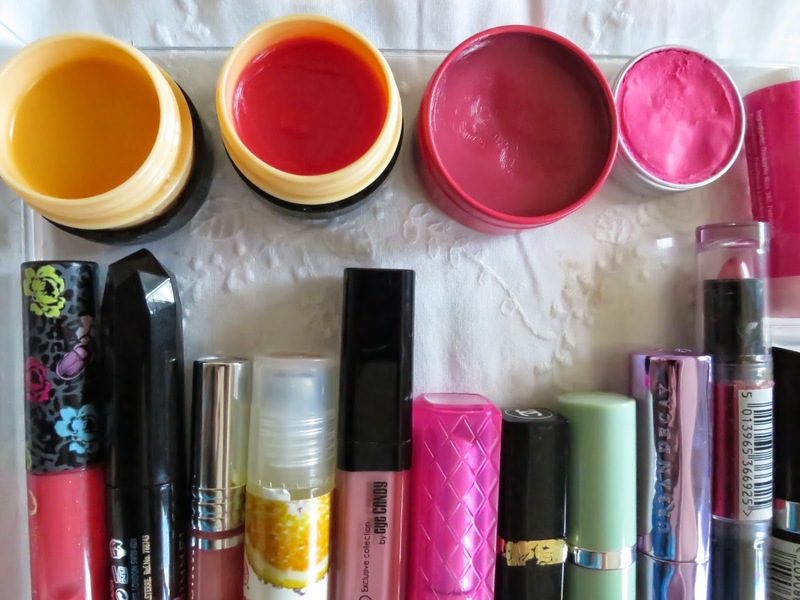 It would be a long post if I went in to all my lipsticks/lip glosses in detail so I will just mention my favourites and list all of them at the bottom. Probably the most vibrant lip product I own is one of Rimmel's Apocalips - on my swatches it is the second one from the right. 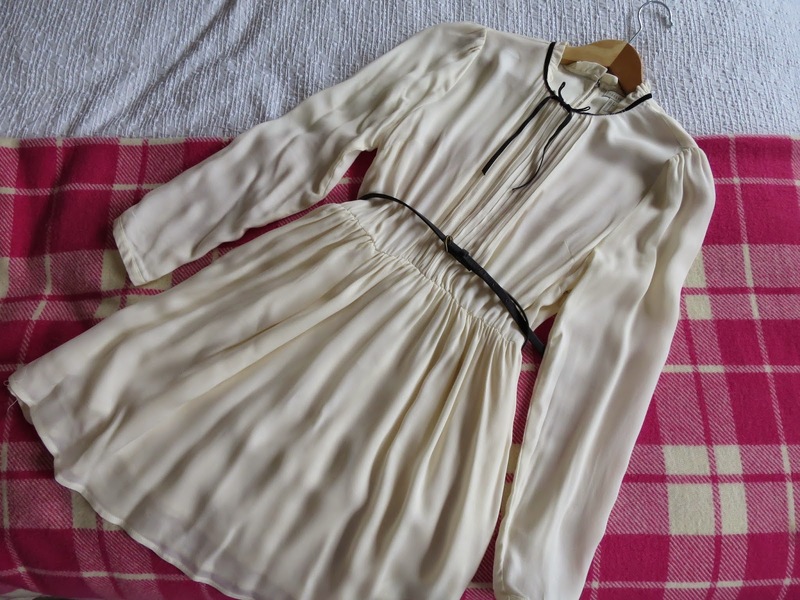 I love wearing this if I have a simple outfit on to brighten everything up; from experience I would say start with a light layer and build it up because it can get very intense. Another favourite is my Tanya Burr's lip gloss in Afternoon Tea, it smells so nice - almost good enough to eat - with scent of strawberry laces running through it. I like to apply this on its own because it is well pigmented. Finally, my favourite lip product is my Urban Decay lipstick in Sheer Obsessed. This is my go to lipstick, as I am writing this, I am wearing it. I find that is moisturises my lips very well but has a great staying power! 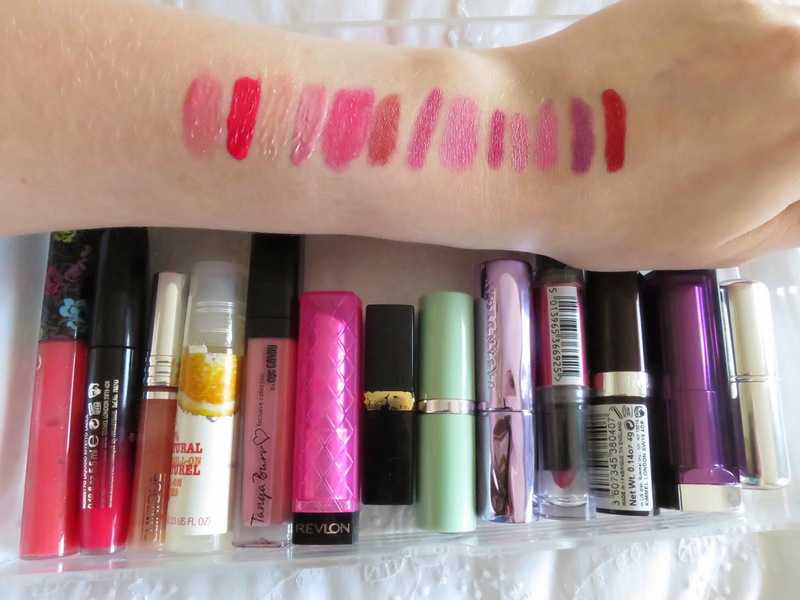 Lipstick/lipgloss collection: from left to right on the swatch photo! Above are a few of my favourite quotes or paragraphs from his books. At the top is a photo of three of his books, I own more but they are on my kindle. 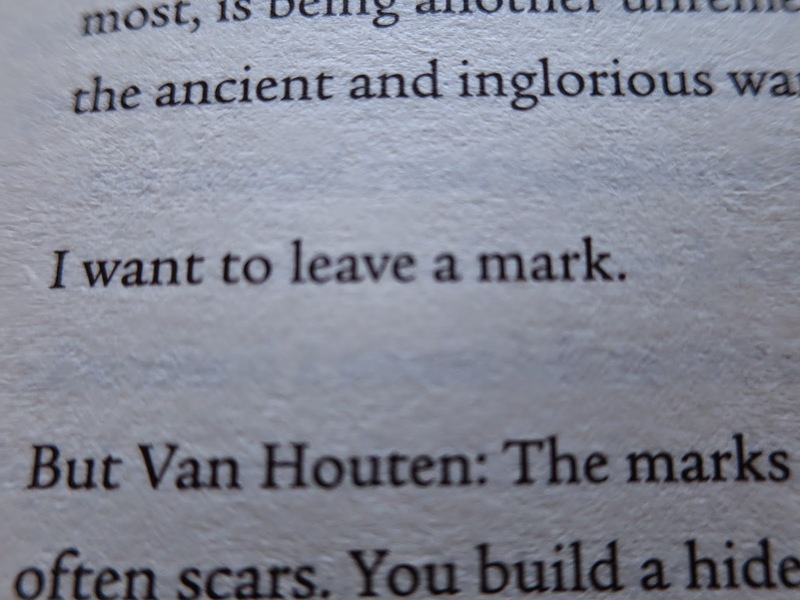 Ever since The Fault in our Stars came out, I have loved the books written by John Green. The stories he tells are so well thought out and are the kind of things I love to read. 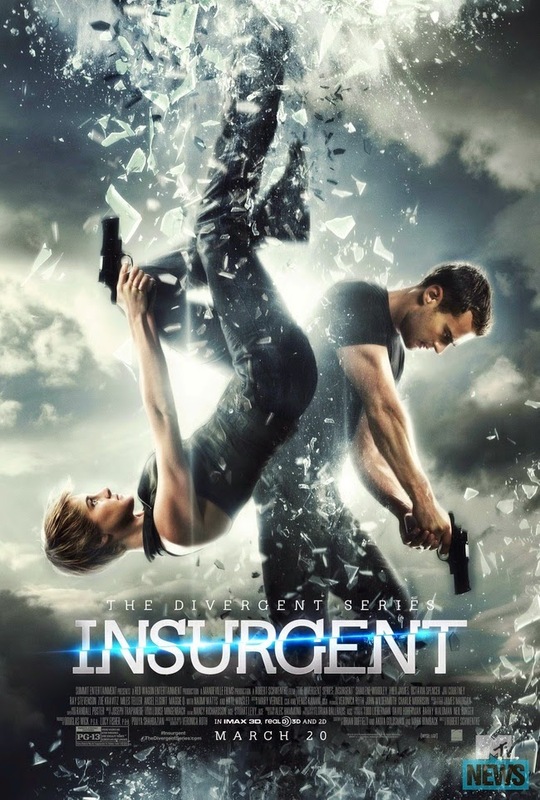 John Green writes often in the perspective of a slightly geeky main character. I feel like this adds to my love of the characters because they have a sweet nature to them. There are also so many relatable scenes in his books which make me enjoy them even more! So this is an overview of my desk area. I wanted to write this post to show how I organise this space and perhaps give some inspiration to how you could organise yours - I am also very nosy and I know that I love reading posts like this! Ages ago, I wrote a post on how to stay organised and this planner was included in it; I still use it every week! It's so useful to put down what you want to do each day and tick it off when you have done that particular thing. If you are wondering, this planner is from Paperchase but I'm sure you can find similar things in quite a few stationary shops. On top of the planner, I usually keep my phone if I am sitting at my desk. To the right of that I have my pink post-it-notes. I love these as they are colourful and really handy if you want to just quickly jot something down! Behind my planner is a pile of books. These three books are some of my favourites, I have: The Fault in our Stars, Love Tanya and the Lauren Conrad Beauty book. I just thought that they looked nice stacked on top of each other and on top of them I have a candle stick from Ikea and a candle from Primark. This candle smells so nice, it is the Sweet Vanilla and Coconut one! To the left of this pile, I have a bird cage lamp which I don't actually have plugged in so it is more for decoration than anything else. The piece of furniture to the right is my chest of drawers/getting ready area. I can do a tour of that if you want as well. On to the other side of my desk. I keep my laptop which is a Macbook air on top of a stand which is from Ikea. Covering the stand, is a place mat and I thought it looked quite nice as it is more interesting than the just plain black design of the stand. I then have my lamp from John Lewis, it is quite cool as it doesn't have a switch you just have to tap the metal parts to turn it on. There are also three settings of brightness - I don't know why but I am very amused by this! Slightly in front of that, I keep my iMini which I mainly just use for the radio. Finally, the last item actually on my desk is my glasses case for when I am working. This hanging container is from Ikea and I store most of my stationary in there! In the left hand pot I keep my pens/pencils/glue stick/sharpies/highlighters and the right hand pot stores my colouring pens which in truth I hardly ever use. Between these pots are some random containers with DIY bits and bobs and some rubbers. I think I also have my umbrella case in there, I'm not too sure why, I'll probably move it after writing this! The picture below is a more birds eye view of the hanging container. I only have one drawer in this desk in which I keep quite random stuff that doesn't really have a place on top. Mainly, there are notebooks but I also have: a pink calculator, some watercolours, a maths set, gel pens and at the back some stamps. I hope this post was somewhat helpful and, as I mentioned previously, if you want my to do a chest of drawers/getting ready area tour, I can do! First and foremost, Happy Easter if you are celebrating today! As I am a Christian and the majority of my family members are, we like to get together every year to spend this day. My grandparents are coming over and we are going to have a Sunday roast. For me today, it isn't about the chocolate. Days like this are precious because I can spend it with my family. I can remember one Easter ages ago when I was little, we had friends round with their children. My best friend was there and we played together, decorated Easter cards, went on an Easter egg hunt - it was lovely. My favourite memories, such as this one, mainly come from occasions like Easter or Christmas. So when Easter rolls around I get really excited to see my family and make new memories. I hope you all have a good day, regardless of whether you are celebrating Easter or not. Eos lipbalm- I bought this when I was buying one for my friend as I heard a lot about it and wanted to try it out. So far, I'm really loving it! The product smells lovely (mine is in the raspberry scent) and it leaves my lips feeling moisturised for hours! Pandora ring - I haven't included an accessory in a favourites post before but in the month of March, I was lucky enough to receive my first Pandora ring! It is a heart attached to a pretty band and I wear this on my middle finger. I love this piece of jewellery very much as it is stunning. Sharpies - Recently, I have become slightly obsessed with using sharpies. In my collection, there are cute pastel colours as well as the originals which I'm using a lot as it is now spring. I just find these useful to pop in your bag if you are going out. 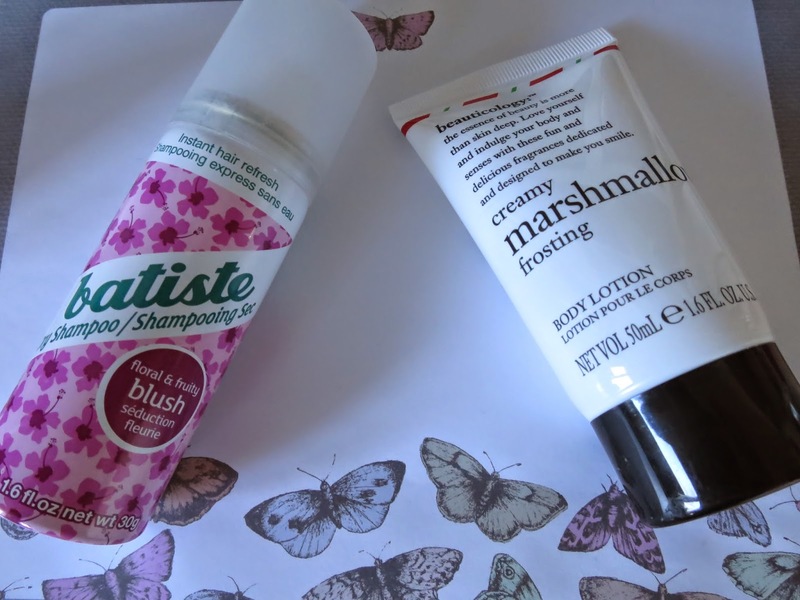 Batiste dry shampoo - I am trying to now wash my hair every two days instead of everyday as it takes a long time to do so and some say it is better for your hair to leave it longer between washes. My hair gets quite oily after a day so I find using a dry shampoo helps it look cleaner. The Batiste one is really good as it also gives my hair a lot of texture which I like. Marshmallow frosting body lotion - I received this last year around the time of Christmas in a set with lots of other Christmassy smelling goodies. This particular one is my favourite as it smells divine and is really good at moisturising my skin. Sometimes you find with products that are in sets smell really nice but the smell doesn't last. However, this one leaves me smelling like marshmallows for hours! Bobbi Brown long-wear even finish foundation - This works really well on my skin and helps me stay matte for longer. The constancy is nice and it even smells good! Recently, I have been reaching for this foundation because I can rely on the fact that it will reduce shininess. I have discovered the band First Aid Kit in March and I really love their music - it's right up my street. Their newest album is now in my Spotify playlist! As per usual, Pretty Little Liars has been my favourite show to watch throughout the month of March. I'm now on season 4 but have heard all about the finale of season 5! Who is this Charles??? ?